Britain’s world speedway championship contender Tai Woffinden spectacularly crashed out of his home Grand Prix at Cardiff’s Millennium Stadium last night. He now faces a massive battle to be fit for the next round of the championship. Woffinden was left with a broken collarbone from a crash in the 14th race of the night at Cardiff’s Millennium Stadium and has only two weeks in which to recover before the next round. With a 40,000-plus home crowd behind him, the Scunthorpe-born rider took a win and two second places from his opening three qualifying rides and looked set to breeze into the semi-finals. But in the fourth of his five qualifier heats, Woffinden collected too much drive on a closely fought first lap and crashed. He brought down race leader Nicki Pedersen as he fell and Fredrik Lindgren was forced to lay down his machine to avoid the resulting tangle of fallen riders and bikes. To make matters worse for the Brit, his riderless bike then appeared to strike him as it came to rest by the track’s outer fence. The 22-year-old was treated on the track and taken away by ambulance, to take no further part in the meeting. The accident knocked the wind from the sails of the British speedway followers, who were revelling in watching a Brit take on the world for the first time in over a decade. Woffinden’s lively performances had them waving Union flags and sounding air horns, but the atmosphere under the Millennium Stadium roof went flat after his departure. The mood wasn’t helped by delays following crashes. The temporary track is laid within the stadium in the days before the event and an inconsistent surface proved difficult even for the best riders in the world. At the time of Woffinden‘s crash he was leading the world championship standings from Russian Emil Sayfutdinov, who made a poor start to British speedway’s biggest night of the year. 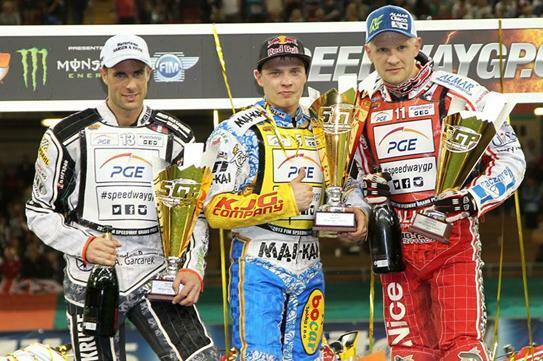 But with Woffinden out of the running, Sayfutdinov found his form and scraped into the semi-finals, then made it through to the final and overcame Denmark's Niels-Kristian Iversen and Pole Krzysztof Kasprzak to win the event. It was the Russian’s third Grand Prix win of the season and he now leads the championship by eight points after five of 12 rounds. Woffinden remains in second place as his seven qualifying points count towards his tally, but with only two weeks’ recovery time before the next round in Gorzow, Poland, his world championship hopes seem to have taken as hard a knock as his collarbone.